When it comes to abstraction, the eye tends to search for familiar shapes. Each person’s perspective and interpretation of an abstract work will be different. 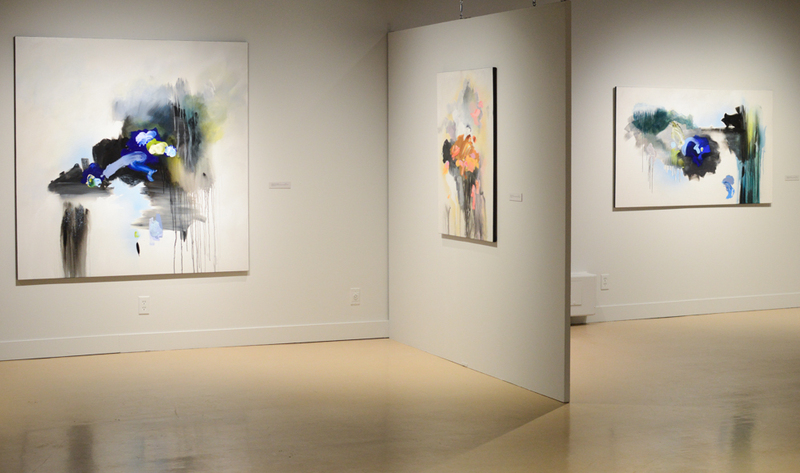 Concordia alumna Sylvie Adams’s solo exhibition, The Time, the Mark , the Space, is no different. Adams chose the title of her exhibition to be representative of her artistic process, which relies on time and gravity. The artist allows the initial application of paint to drip down the canvas, letting physics create her underpainting. The colours mix without the artist manually affecting the nature of the paint. Once Adams feels ready, she will make intuitive markings with acrylic paint, India ink or spray paint. She lets the piece speak to her; the universe pulls her towards making specific marks on some pieces and not on others, she explained. It is in this phase that the image begins to take shape. The artist graduated from Concordia University in 1987 with a major in design and a minor in visual arts. At the time, Adams did not spend much time painting, but when she did, she preferred creating realistic depictions. It was Marilyn Rubenstein, an abstract artist, who encouraged Adams to begin her abstract practice. When the two met, Rubenstein was a drawing and painting teacher at the Saidye Bronfman Centre School of Fine Arts, now the Visual Arts Centre. Today, Adams practices lyrical abstraction, a form of abstraction that uses softer, looser brushwork. The practice is largely based on the artist’s painterly intuition. “I start with a neutral, black-and-white background, and I start to play with different mediums, experimenting with their fluidity. Some parts I will wet, others I will not,” Adams explained. She said she also likes to leave some sections untouched, exposing the raw canvas to create a balance between the strokes, dripping paint and sprays of colour. The artist uses a paper cut-out to shield sections of the painting and isolate some elements, enforcing the negative space between one part and another. “When I start painting, I don’t know what it will look like, I don’t know what colours I’ll use,” Adams said. Intuition and reason are key in her practice. She must be sure the mark she will make is the right one. Some abstract work is created chaotically, but Adams’s isn’t. Her paintings are carefully crafted, just as a realistic painting would be. Yet unlike realism, Adams has no set subject matter. Adams forms a dialogic relationship with her work. Each mark she makes utters a response, leading the artist to her next movement. “It is as though the painting is saying something to me,” she said. “I just have to be open to it.” The final result is a painting symbolic of a conversation the artist has with herself and her work, bringing her intuition, dynamic actions and personal thoughts, feelings and emotions into play. The dialogue Adams holds with her work is a meditative one, which she admits can be quite frustrating. Some pieces, like Cookie Monster, are kept in the studio for a few months before the artist realizes the mark she is compelled to make. In its early stages, Cookie Monster was without the two strokes shaped like the number six. Adams recognised the body of a monster in her application of dark paint as it dripped in a way that illustrated teeth. To highlight this idea, Adams felt the need to give it eyes. Despite the monster appearing in Cookie Monster, Adams’s paintings are comforting and can be relatable to viewers who look closely. Individual experiences draw people to different pieces and change what people take away from her work. The Time, the Mark , the Space also features a series of portraits. The artist uses a combination of warm flesh tones, black and white to create a hidden visage. In Portrait de Genre I, Adams saw the face of an old man, while one viewer saw the face of a baby wrapped in a pink blanket, and another recognized U.S. President Donald Trump. Adams uses three distinct colour palettes in The Time, the Mark, the Space: a series of warm tones (pinks, beiges, oranges, browns) as seen in the Portrait de genre series I-IV and Cookie Monster; cool tones ranging from blues and greens in Frostbite, Cri Primal, Winter Day at the Lake and Blueberry Lime Sorbet, and finally a series of rich burgundy, orange, green, and red tones in Close Call, La marche du temps, Chemin en Mutation and Mango Chutney. The exhibition’s 13 paintings were all created last year, and each one symbolizes the creation of a world, as stated in the galley brochure. The Time, the Mark , the Space is open from 1 p.m. to 7 p.m. Tuesdays and Wednesdays, until 6 p.m. on Thursdays and until 5 p.m. on Friday and weekends. It will be displayed at Maison de la culture Marie-Uguay (6052 Monk Blvd.) until March 25.